On September 25th an extended meeting in Stavropol State Medical University Rector office was held, dedicated to the prospects for Russian-Indian cooperation in science and education. It was attended by the Rector of the Delhi Pharmaceutical Research University Professor Ramesh Goyal, Deputy of the Tamil Nadu State, Member of Parliament of Shri. Anwhar Raajhaa and the Director of A. J. 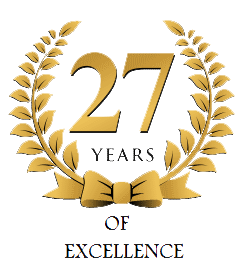 Trust Educational Consultancy Dr. A. Najeerul Ameen. 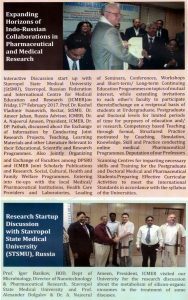 The main focus was given to the reports “Scientific and Innovation Potential of the State Medical University and Prospects for Joint Cooperation” by Prof. V.A Baturin, Director of the Research Institute of StSMU, and “Results of the visit to the scientific and educational institutions of India. Joint Russian-Indian projects “by Professor I.A Bazikov. The meeting in the rector’s office concluded with the signing of cooperation agreements between StSMU and the Delhi Pharmaceutical Research University. In conclusion, the president of the Doctors Association-Stavropol Territory, the chief physician of the regional clinical Dermato-Venereological dispensary, Professor.M.A Zemtsov, dedicated Rector of the Delhi Pharmaceutical Research University, Professor Ramesh Goyal and Deputy of the Tamil Nadu State, Member of Parliament of Shri. Anwhar Raajhaa. The meeting of the administration was preceded by a meeting of the delegation from India with The Deputy of the Stavropol Territory: Speaker of the Parliament G. V. Yagubov, Chairman of the Stavropol Territory Deputy of the Committee on Social and Youth Policy, Education, Science, Culture and the Media, Professor of the Department of Public Health and Public Health, medical prophylaxis and informatics with the course of DPO professor V.N Muravieva and others. Also in the meeting were the Rector of StSMU professor V. I. Koshel and the pro-rector for international and inter-regional activities of StSMU professor K. R. Amlaev were present.